Anyone who has spent time in or around the Sierra Nevada has to agree that there’s something special about its interaction with light. Towering one to two miles above the surrounding terrain for nearly all of its 400-mile length, the Sierra Nevada are California’s most prominent natural feature. But it’s not just prominence that sets the Sierra apart. The Sierra are almost entirely granite, an intrusive igneous rock comprised primarily of light-toned feldspar and liberally infused with lustrous quartz and mica. Because igneous intrusive rocks form deep beneath the Earth’s surface, constituent minerals cool and harden slowly enough for large, reflective crystals to form. In addition to its inherently reflective qualities, granite is quite hard and resistant to erosion. Unlike the overlying sedimentary and metamorphic rock that washed downhill as the Sierra pushed (and continues to push) upward, granite remains intact when subjected to wind and rain. Eventually small cracks form; water percolating into these cracks expands as it freezes, widening the cracks further until the granite fractures and a large block separates. The result is large vertical and domed surfaces whose extreme slope and hardness are particularly inhospitable to plant life, even well below the timberline. Granite’s hardness also means that rather than crumbling beneath the weight of the numerous glaciers to scour the Sierra, much of the Sierra granite has been polished to a glassy sheen. Granite’s light complexion, reflective inclusions, and abundance of exposed, polished surfaces make the Sierra particularly inclined to reflect the color of whatever light illuminates it. This relationship with light is quite evident in Yosemite Valley, nestled in the range’s more moderately sloped west side. When the sun strikes Yosemite’s Half Dome and El Capitan at day’s end, warm sunset light paints these monoliths in brilliant orange and red hues just before the sun is snuffed by the horizon. While this color can be seen at sunset year round, it takes center stage each February when sunset shadow and light conspire to highlight normally insignificant Horsetail Fall’s tumble down El Capitan’s east face. As exquisite as the light on Yosemite’s granite is, I’m even more drawn to the Sierra’s east side, which gets its best sun at sunrise. Unlike the Sierra’s gradually sloped, relatively moist, and largely foliated west slopes, the Sierra’s east side is much steeper, drier, and therefore sparsely foliated and more exposed. Enhancing the drama, the Eastern Sierra’s towering granite face also catches the earliest possible sunlight, sunlight that has traveled farther and through purer air (because there fewer airborne pollutants in the morning in general, and the sunlight east of the Sierra traverses much less densely populated terrain). My favorite place to watch the light play on the Eastern Sierra granite is in and near the Alabama Hills, two vertical miles beneath Mt. Whitney and the Sierra’s most precipitous section. Looming above the Owens Valley, 14,505 foot Mt. Whitney is the highest point in the 48 contiguous United States. Unlike many towering peaks that stand by themselves, Mt. Whitney is bounded by 13,000 foot Lone Pine Peak and 14,000 foot Mt. Williamson, all connected by a serrated ridge of 13,000+ foot sharks tooth prominences. Before sunrise I like to arrive early enough to see the Sierra crest reflect the pale blue of the pre-dawn sky, then watch it warm gradually as the sky brightened before the approaching sun. The color reaches a crescendo when the sun’s longest wavelengths first kiss the highest peaks with pink alpenglow. As the rest of the sun’s visible wavelengths join the party, the crest warms to amber before finally cooling beneath the daylight-blue sky. At the end of the day the best color arrives after the sun has long disappeared behind the crest and the entire scene is illuminated by a sky well on its way to night. Though the mountains’ color is more subtle than the sunrise show, the Eastern Sierra’s granite when imbued with the pale mauve of evening twilight is no less beautiful. 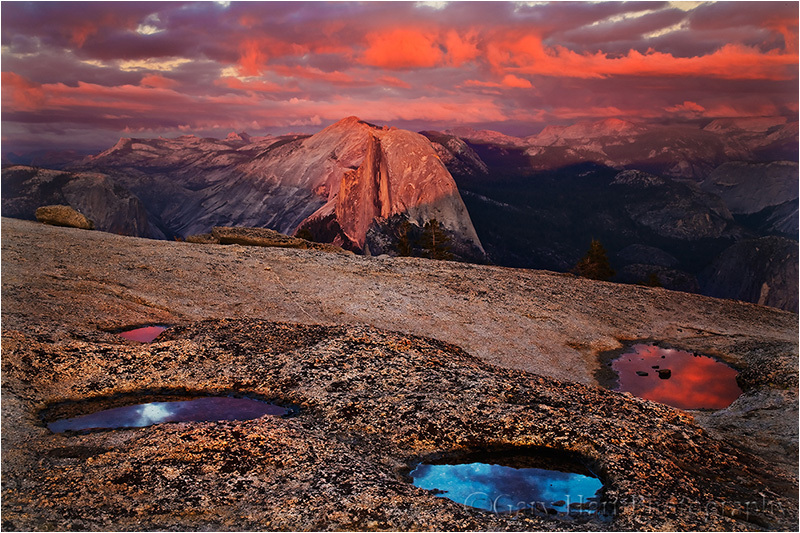 Eventually night takes over and once again the Sierra granite throbs a soft blue. Early last October I guided my Eastern Sierra workshop group up to Whitney Portal at the base of Mt. Whitney to photograph cascading Whitney Portal Fall in late afternoon shade. On the drive back down we squeezed into a small turnout not too far down the road for the closest view of Whitney that doesn’t require a serious hike. This year’s group got a bonus when a thin slice of brand new moon appeared shortly after sunset. Mounting my Sony 70-200 f4 on my a7RII, I framed the scene as tightly as I could while still including both Mt. Whitney and the crescent moon. Though the sky was clear, a steady stream of small clouds materialized as if issued by a cloud making machine just out of sight behind the crest to the right of Whitney. Each new cloud scooted to the left and dissipated quickly in drier air near the summit. After composing, metering, and focusing, I waited for the next cloud to appear and clicked this frame in the purple twilight. While every season in Yosemite offers something that makes it special, the most beautiful place on earth is at its most beautiful when every exposed surface for as far as the eye can see is made brand new and pristine by a blanket of fresh snow. 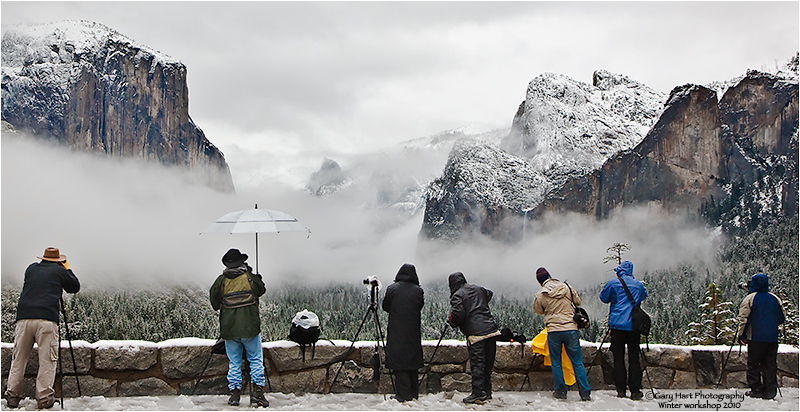 But capturing Yosemite’s winter magic isn’t a simple matter of showing up on a winter day with a camera. At just 4,000 feet above sea level, Yosemite Valley gets more rain than snow, and significant snow falls only during the coldest storms, usually just a handful of times each winter. Photographing snow-covered Yosemite requires planning and patience: planning to ensure your arrival before the snow stops; patience to wait out the storm when visibility is so poor that you can barely see the nearest tree. When the snow stops, Yosemite’s relatively mild temperatures (usually in the 30s when it snows) conspire with sunshine, wind, and gravity to clear the trees in a matter of hours. Meanwhile, park visitors driven inside by the storm, swarm outdoors to gape, quickly adding footprints and spreading mud with their boots, bikes, and cars. In other words, if you delay your departure for Yosemite until you hear that it snowed there, you’re too late. The key is being in the park during the storm. All winter I monitor the National Weather Service Yosemite forecast and discussion (in-depth forecast analysis) pages for hints of a cold storm. I know there are lots of weather forecast options out there, but most either lack the resources of the NWS, or simply use the NWS data. The NWS may not always nail the forecast, but they’re more consistent and reliable than all the other options. Sometimes the weather can change at the last minute, but I’m always ready. (It doesn’t hurt that I live less than four hours by car from Yosemite Valley.) In the back of my AWD Subaru Outback all winter are chains (required to be carried in Yosemite in winter, even with AWD/4WD), a portable charger that can recharge a car battery (among other things) in a pinch, and a duffle bag with all my cold weather gear (waterproof pants and upper shell, hat, gloves, umbrella, and ice grips for my shoes). Once I decide I’m in, I’m all in. That usually means getting a room in or near Yosemite Valley, driving to the park a day early, and waiting for the snow to start. Once the snow arrives, I don’t hole up in my room, I’m out shooting. Even though Yosemite’s storms often erase all signs of its most recognizable features, stormy weather is a great time to photograph swirling clouds and accumulating snow in glorious (and rare!) solitude. As much as I love photographing Yosemite in near white-out conditions, I sometimes get too cold, wet, or worn out to continue. But even when I reach that point, I don’t go in. Instead, I park at Tunnel View and wait for the weather to clear. Tunnel View is the perfect place to wait out a Yosemite storm because it’s on the west side of Yosemite Valley (where the clearing usually starts), provides an elevated vantage point with a view all the way down to Half Dome on the valley’s east side, and is spectacular to photograph when the storm clears. It even has decent cell service. And if I’m looking for an excuse to turn on the engine and warm things up, I drive through the tunnel for a view to the west, a preview of coming weather. My final advice for anyone waiting out a storm at Tunnel View is when the storm clears, don’t spend so much time there that you miss opportunities elsewhere. This is easy to do because the photography will remain spectacular long after you should have moved on to other scenes. Among my many snowy-Yosemite go-to spots is Cook’s Meadow. On this trip several years ago, until the snow arrived, the meadow was a field of lumpy brown grass, its sentinel elm a bare skeleton in the shadow of Half Dome. But a few inches of overnight snow transformed the bland meadow into an undulating sea of frozen white waves and etched the tree in white. The snow was still falling when I arrived, wet and fast, slanted by a stiff breeze. Half Dome was gone. I positioned my tripod so the elm stood by itself, balanced in the frame by a stand of evergreens. The falling snow added an interesting dynamic to the otherwise static scene and I chose a 1/4 shutter speed that would blur its motion to streaks of white. Most callers responded with anecdotes about bus schedules, school years, and work hours that revealed how conventional time measurement tools, the arbitrary units of clocks and calendars, rule our existence. Listening while on my morning run, I was unable to call in to share my own (significantly different) relationship with time, so you’re stuck with reading about it here instead. Landscape photographers are governed by far more primitive time constructs than the bustling majority. We follow the fundamental laws of nature that inspire but ultimately transcend clocks and calendars: the earth’s rotation on its axis, the earth’s revolution about the sun, and the moon’s motion relative to the earth and sun. The clocks and calendars that have little to do with the picture taking aspect of my life are useful only when I need to interact with the rest of the world on its terms (that is, run the business). While my days are inexorably tied to the sun’s and moon’s arrival, and my years are ruled by the changing angle of the sun’s rays, I can’t help long for the ability to mark my calendar for the rainbow that arcs above Yosemite Valley at 4:29 p.m. every May 26, or the lightning bolt that strikes the Grand Canyon’s South Rim at 2:45 p.m. each August 18. But Nature, despite human attempts to measure and manipulate it, is its own boss. The best I can do is schedule workshops and personal photo trips to maximize my odds for something special, then show up and hope for the best. The insignificance of clocks and calendars is never more clear than the first morning following a time change. On the last Sunday of March, when “normal” people moan about rising an hour earlier, the sun thumbs its nose at Daylight Saving Time and rises a mere minute (or so) earlier than it did the day before. So do I. And on the first Sunday of November, as others luxuriate in their extra hour of sleep, I get to sleep an entire minute longer. Yippee. There’s irony in the immutability of the natural laws responsible for the (perceived) randomness of the very events we landscape photographers covet: earth’s revolution and rotation, our orbiting moon, each predictable in microseconds, set in motion the atmospheric and tidal dynamics that are the catalysts for unpredictable seasons, weather, and waves we photograph. Ironic or not, I love nature’s mixture of precision and randomness. Though I try to maximize my odds for photographically special natural phenomena, understanding that “it” might not (probably won’t) happen only enhances the thrill when something special does happen. The lightning in today’s image was certainly not on anyone’s calendar, but knowledge of the Grand Canyon’s August monsoon enabled Don Smith and I to schedule our annual Grand Canyon Monsoon workshops for the best time to be there. And despite the uncertainty, it was no fluke that we had our group on the North Rim and within sprinting distance of the Grand Canyon Lodge viewing deck (with Lightning Triggers primed and ready) when the clouds started building and darkening across the canyon. This turned out to be a special day. After several fruitless afternoons of ticking seconds that stretched to minutes and hours, our group was treated to a two-hour electric show that left us all giddy and breathless. This strike came and went in milliseconds, so fast that I had no idea that it was actually a pair of intertwined bolts, a secret revealed only by my camera’s ability to freeze time. In a previous life, I spent a dozen or so years doing technical support. In this role, job-one was convincing people that, despite all failures and error messages to the contrary, they are in fact smarter than their computers. Most errors occur because the computer just didn’t understand: If I misspel a wurd, you still know what I meen (rite? ); not so with a computer. A computer can’t anticipate, reason, or create; given a task, it will blithely continue repeating a mistake, no matter how egregious, until it is instructed otherwise, fails, or destroys itself. All this applies equally to today’s “smart” cameras—no matter how advanced its technology, a camera just can’t compete with your brain. Really. If I’d have allowed my camera to decide the exposure for this crescent moon scene, I’d have ended up with a useless mess: The camera would have decided that the foreground hillside was important and allowed in enough light to expose distracting detail and completely wash out the color in the sky. But I knew better. Wanting to simplify the scene, I manually metered and banished the insignificant details to the black shadows, capturing only the moon’s delicate shape and a solitary oak silhouetted against the indigo twilight. It’s scenes like this that cause me to never trust my camera’s decision making, and why, in my (many) decades of serious photography, I’ve never used anything but manual metering. And since I try to have elements at different depths throughout my frame, focus is almost always my decision, not my camera’s, as well. Today’s cameras are more technologically advanced than ever—their auto exposure and focus capabilities are quite good, good enough that nobody should feel they must switch to manual if they fear it will diminish the pleasure they get from photography. But if you define photographic pleasure as getting the best possible images, try spending a little time mastering manual metering and hyperfocal focus, then use that knowledge to override your camera’s inclinations. In my workshops, where I teach (but never require) manual metering and hyperfocal focus to all who are interested, people frequently marvel at how easy and satisfying it is to take control of their camera. And speaking of control, for this image I even controlled the new moon’s position relative to the tree. Roaming a hilly cow pasture in the foothills east of Sacramento gave me full freedom of movement. As the sky darkened and the moon dropped and slid to the right, I ran up and down the hill to put the moon in different places in my frame, and to juxtapose it with this tree and another tree nearby. In addition the standard photographic imperatives (composition, exposure, focus), I had to hopscotch around abundant piles of fresh “fertilizer,” and stay alert to the potential for an encounter with its source. And then there were the rattlesnakes…. When all was said and done, I’m happy to report that no photographers were harmed in the making of this image. Photographers frequently complain about what their camera can’t do, and take for granted the things it does well. A lot of this is a frustration with the inability to duplicate the world the way we see it. But honestly, what fun is that? My favorite photographs are those that show me something I might have overlooked or were not visible to my eye to my eye at all. As someone who tries to photograph a world untouched by the hand of Man, I particularly love the camera’s ability to return me to simpler times, reducing a scene to its essence by subtracting reminders of human incursion. I recently returned to this small stand of oak trees huddled atop a hill in the low foothills east of Sacramento. Since I first photographed this scene over ten years ago, the peaceful country road “my” hill overlooks has evolved into a bustling artery for oblivious commuters. More recently, fencing has sprung up and an arcing dirt road has been carved into the hillside, a harbinger I fear of an impending subdivision. They’re everywhere up here now, these cookie-cutter developments with meaningless, corporate-crafted street names (Aspen Meadows Drive, Teakwood Court), devouring this once bucolic setting like a stage-4 cancer. Despite the distractions, my camera’s “limited” vision instantly returns me to more peaceful times. Gone in a shutter-click are the highway’s roar and choking exhaust, while the encroaching suburbs are banished by the narrow view of a telephoto lens. And that scar of a road? It disappears in the shadows of the camera’s narrow dynamic range. I rarely shoot at Mather Point because I’m usually working with workshop students struggling to corral the extreme dynamic range of a summer sunrise there. But on this morning a couple of weeks ago, about half the group had congregated at the rail in near the Mather Point amphitheater, allowing me to set up my tripod and occasionally visit my camera. When it became clear that the clouds were setting up for something special, I prepared my composition, set my f-stop to f/18 (in the sunstar zone), and ready my graduated neutral density filter in anticipation of the sun’s first rays peeking out from behind Wotan’s Throne. As with many of my images, I can trace this image’s creation to long before the shutter clicked. That’s because, whenever possible, I avoid arriving at a location without knowing at the very least when and where the sun will appear or disappear. In this case I was familiar enough with the Mather Point in August to know that the sun would rise between Wotan’s Throne and Vishnu Temple. But I needed to be more precise than that. We’re living in an era of ubiquitous information, carrying mini computers with the potential to make virtually everyone an instant astronomical genius. Though my own workflow for computing sun/moon arrival/departure information was established long before smartphones, it amazes me both how easy the internet and smartphones have made preparation, and how few photographers do it. I got a little head start because I studied astronomy in college for a few semesters (long enough to learn that the essential math would would wring the marvel from my mind), enough to have good mental picture of the celestial rotations and revolutions that determine what we see overhead and when we see it. While I’m just geeky enough to prefer plotting all this stuff manually, for most people I recommend starting with one of the excellent apps that automate most of the process. Of the two apps I recommend, PhotoPills and The Photographer’s Ephemeris, I prefer PhotoPills because it seems more complete, but they’re both excellent. If you’ve tried either of these apps and found them too complicated, don’t be discouraged—neither is so intuitive that you should expect to simply pick it up and use it. But each is logical and well designed, and I promise that the more you use it, the easier it will become. In other words, practice! As with most things in photography, it’s best not to be trying to learn to predict the timing and position of the sun or moon when the results matter. Rather, I suggest that you plot tonight’s sunset from the park down the street, or tomorrow’s sunrise from your backyard. Figure out where and when the sun will set or rise, be there to check your results, and then figure out why it didn’t happen exactly as expected. You’ll be surprised by how quickly your predictions improve after repeating this process a few times. Once you feel comfortable with your ability to anticipate a sun or moon rise or set from home, it’s time to take the show on the road—pick a spot you know fairly well and apply your new knowledge there. For me, celestial preparation from the comfort of my recliner is only half the job. It’s great when I know exactly where I’ll be and when I’ll be there, but the reality of nature photography isn’t quite so simple. On a first visit to a new location, I often end up places I never imagined I’d be—Hmmm, I wonder where that road goes…, or, Gee, I bet the view from the top of that hill would be great…—often with no connectivity. On location with no connectivity, I need to be able to figure out the celestial details with only the resources at hand. The two iPhone apps I’ve come to rely on most are Focalware (I couldn’t live without this app) and MotionX-GPS. Focalware provides sun and moon rise/set times, the moon phase, and the altitude and azimuth of the sun and moon—all for any any time and date, and any location on earth. It uses my phone’s GPS to determine my current location, but doesn’t require cell or wifi connectivity. MotionX-GPS gives me topo maps and the ability to plot point-to-point linear distance as well as azimuth. While its maps do require connectivity to download, I can pre-download them to my phone so they’ll be available when I’m offline. Using these two apps, plus my basic understanding of astronomical dynamics, I’m able to figure out everything necessary to plan a shoot. On this morning at Mather Point, I pulled out my iPhone and opened Focalware to determine the sunrise time and azimuth. I used the MotionX-GPS Measure tool to drop a pin at my current location, then stretch a line, at the angle of the sunrise azimuth, across the canyon until it intersected the horizon. That was all I needed—seeing that this sunrise line passed just to the right of Wotan’s Throne, I was able to set up the composition I wanted.